Xtech® Premium GOPRO Piece Accessory Kit includes includes many practical and useful accessories that enable capturing pictures and videos in practically any place and angle, indoor, outdoor, underwater or while in motion with a GoPro HERO3 Hero 3, Hero3+, GoPro Hero3+, GoPro Hero3, GoPro Hero2, GoPro HD Motorsports HERO, GoPro Surf Hero, GoPro Hero Naked, GoPro Hero 960, GoPro Hero HD 1080p, GoPro Hero2 Outdoor Edition Digital Cameras. 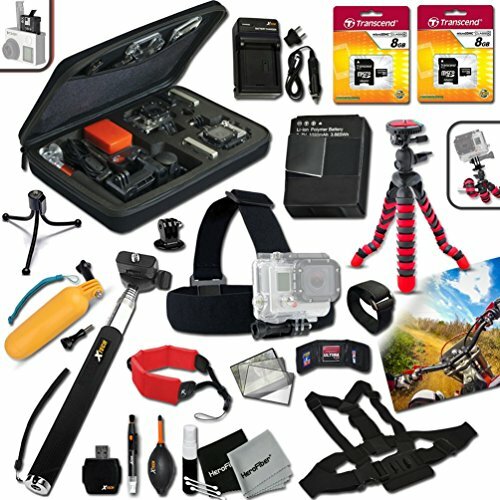 The Accessory Kit includes a Head Strap Mount, Chest Strap Mount, 16GB High-Speed Memory Card, a High Capacity AHDBT-302 Battery Made for the GoPro HERO3 Hero 3, Hero3+ Camera, AC/DC quick Charger w/ Car Adapter, a 12 inch Highly Flexible Tripod, a Hand Held Monopod, a Well Padded Custom Large Case to fit many gadgets and accessories, A Floating Bobber Handle, an Adjustable Remote control Wrist Strap, a floating foam strap, a Mini Table Adjustable Tripod, a universal card reader and a deluxe cleaning pen and air blower. Additionally Included in the Premium Accessory Kit is a HeroFiber Ultra Gentle Cloth which is made from unique fabric specially designed to clean electronics and accessories. Xtech® Premium GOPRO Accessory Kit includes many practical and useful accessories that enable capturing pictures in practically any place and angle with a GoPro HERO3 Hero 3, Hero3+, GoPro Hero3+, GoPro Hero3, GoPro Hero2, GoPro HD Motorsports HERO, GoPro Surf Hero, GoPro Hero Naked, GoPro Hero 960, GoPro Hero HD 1080p, GoPro Hero2 Outdoor Edition Digital Cameras. Includes Head Strap Mount, a Chest Strap Mount, a High Capacity AHDBT-302 Battery Made for the GoPro HERO3 Hero 3, Hero3+ Camera + AC/DC Quick Charger w/ Car Adapter and a 12 inch Highly Flexible Tripod for capturing in practically any angle. Includes a 16GB High-Speed Memory Card, a Well Padded Custom Case to fit many gadgets and accessories and a Hand held Monopod with a Tripod mount for GoPro Cameras. Includes a Floating Bobber Handle, Remote control Wrist Strap, Floating Foam Strap Universal Card Reader + Mini Table Tripod + Deluxe cleaning kit. Includes a HeroFiber® Ultra gentle cleaning cloth designed for cleaning electronics and accessories. If you have any questions about this product by Xtech, contact us by completing and submitting the form below. If you are looking for a specif part number, please include it with your message.